We have discussed much about the baldor servo drives and motion controller in our earlier articles. Today we will see the operation and installation procedure of Baldor BC140-FBR DC Drive. Baldor DC drive are very popular for the conveyor and material handling applications. BC140 supports multi - horse power motor and can be used to run the DC Motor of ratings from 1/100 to 2 HP.BC140-FBR can be operated on both AC115 and AC230V , so dual voltage operation is also possible. We will try to cover all necessary points to install and commission the BC140 -FBR DC Drive. Let us quickly discuss the features which BC140 has got. Full wave SCR control is possible with the help of freewheeling diode. This drive can be used with both shunt wound DC Motor and permanent magnet type DC motor. Aslo it has got 5K pot for the speed regulation. It has got trimpot for max speed , min speed and accel/decel and IR and CR trimpot. The rpm is 250 and provide full torque at zero speed also. Well we will discuss some quick points in order to make a BC140 drive operational. Let us note one point that this drive has the feature of supporting the motor of ratings from 1/100 Hp to 2HP. So accordingly to the motor selected we have to put a proper Horsepower plug in resistor inside the drive. The rating of the resistor for BC140 drive is calculated according to the motor HP and input supply voltage we intend to connect to drive. 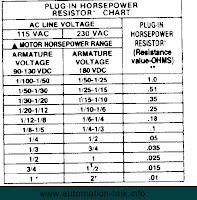 We will see the ratings of Horsepower resistor for different motor ratings below. 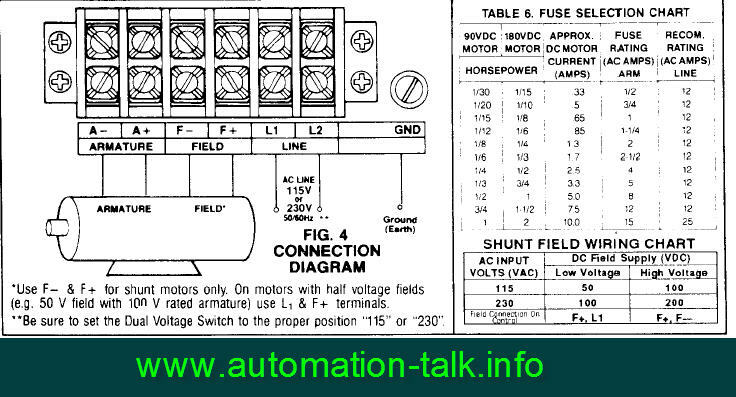 1.First of all , set the Dual supply voltage on the fron side of the drive to the proper ac supply voltage , i.e if the input supply connected is 115 then set the switch to 115 and if input ac supply is 230 then set the switch to 230V. 2. Open the front cover of the drive and plug-in the proper horsepower resistor. 3. Install the correct line and armature fuses. Connect the motor armature and field wires. 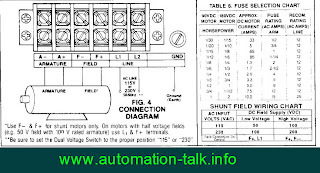 See the below diagram for the connection procedure and ratings of the fuse. 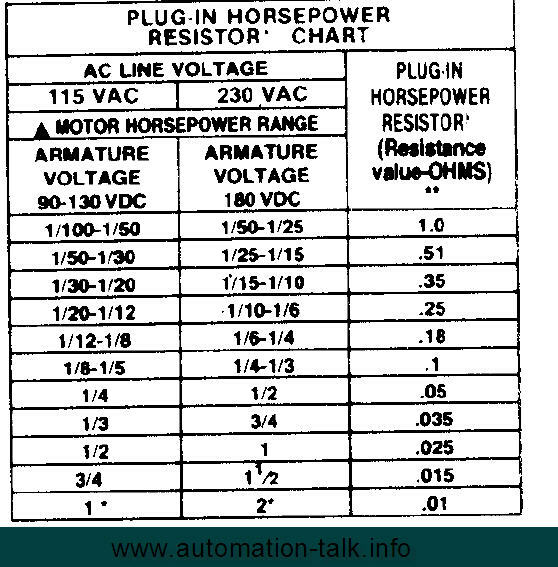 The below is the table for the selection of the Plugin horsepower resistor , you have to install the proper and the correct value of resistor in BC-140 drive , otherwise the desired efficiency will not be achieved. After doing all the three steps as told above , just power on the drive and turn the speed pot slowly from minimum to maximum , and see the motor operation. The motor rpm will increase slowly when you turn the speed knob from minimum to maximum. If you wish to change the acceleration or deceleration time then this can be done with the help of the trimpots provided on the drive. We hope that after reading this Baldor BC-140 FBR tutorial you can easily commission the drive and run it. If still you face any problem then you can write to us in the comment section. And if you like the article , we would like to see u on Facebook.Flike!! Also you can subscribe to receive all the updates on DC Drive.! !